A trio of Canadian adventurers said Friday they have set a record for the fastest trek across Antarctica to the South Pole. 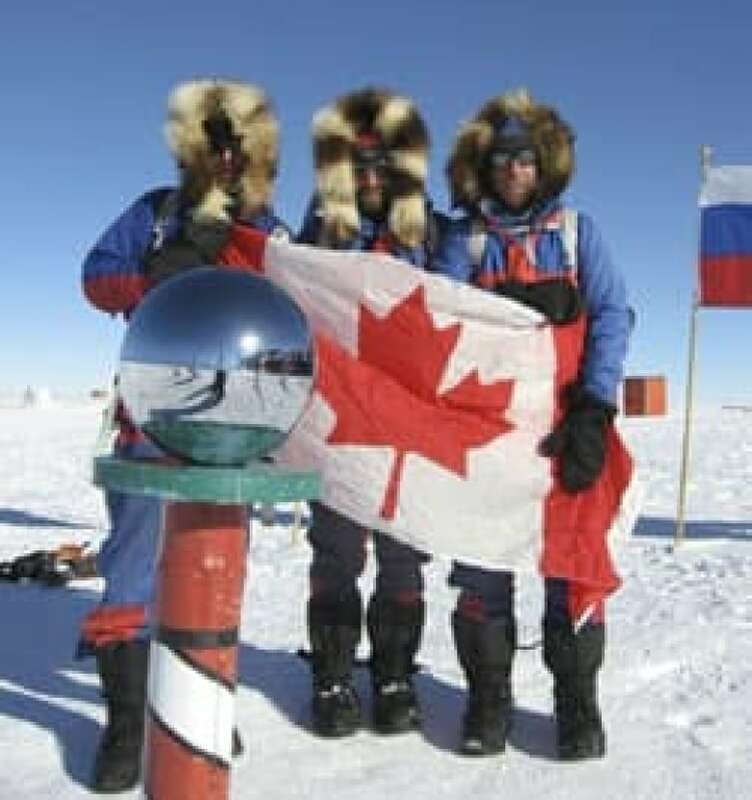 Three Canadian adventurers said Friday they have set a record for the fastest trek across Antarctica to the South Pole, after suffering through whiteout conditions, temperatures as low as 40 below — and a steady diet of deep-fried bacon and butter. Ray Zahab said he and his teammates completed the 1,130-kilometre journey from Hercules Inlet on Antarctica's Ronne Ice Shelf to the South Pole in 33 days, 23 hours and 30 minutes, finally arriving Thursday. "If you took a cloud, wrapped it around your head and then duct-taped it, that's what a whiteout is like," a weary yet animated Zahab, 39, of Chelsea, Que., said by satellite phone from Antarctica. Zahab is best known for his epic 6,920-kilometre run across the Sahara Desert in 2007, which was the subject of a documentary narrated by actor Matt Damon entitled Running the Sahara. Tom Sjogren, founder of ExplorersWeb.com, a New York-based website that compiles statistics on adventurers' feats, said the men beat the record of 39 days, seven hours and 49 minutes set by American Todd Carmichael just last month. "They have definitely broken the record," said Sjogren, who uses a variety of materials, including photographs of explorers' GPS co-ordinates and their logs, to help verify records. Zahab and his teammates — Kevin Vallely of North Vancouver and Richard Weber of Alcove, Que. — documented their journey on their website, using their satellite phone to post photos and podcasts along the way. They pulled 77-kilogram sleds of equipment, with Zahab travelling on foot and on snowshoes while the other two men skied. At night, they hunkered down in a tent to sleep. The men suffered altitude sickness, vertigo and massive, painful blisters. They kept themselves fuelled with a 7,000-calorie-a-day diet of deep-fried bacon, cheese and huge chunks of butter. "I am dying for pizza," Zahab said with a sigh Friday. "All I've been thinking about is pizza." He was longing, too, for his six-month-old daughter, Mia Sahara, and wife of two years, Kathy. "All I would do is think about them and think about how I would spend the day with them and how I would never complain about changing a diaper again," he said.